Nothinggets the attention ofwomen more than standing in the midst of an ice cavern with little clothes and showing off your bare chest. Holding your short sword in an inspiring way while standing by your Viking boat sleigh. That’s right. A boat sleigh. And why is WERE BLOOD two words? 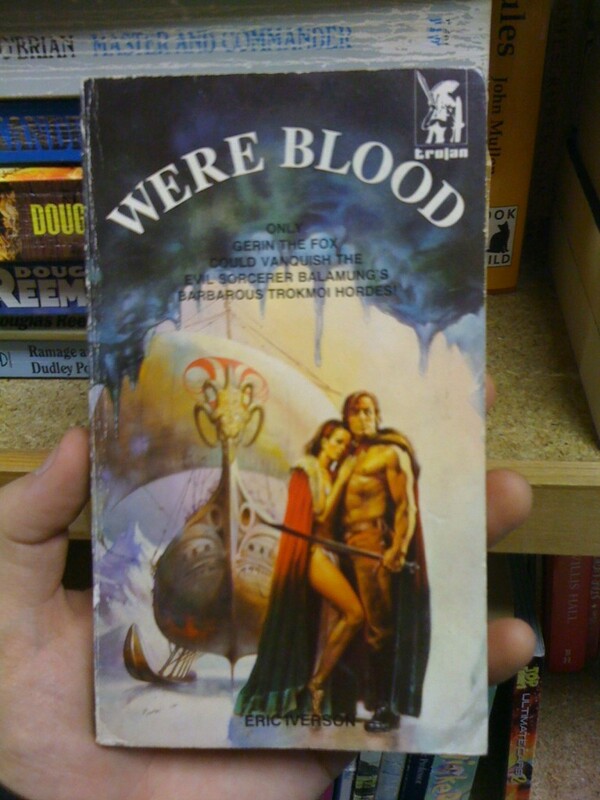 Surely it should be WEREBLOOD, as in werewolf, which is presumably the derivation. It really looks as though everyone gave up on this one at the design meeting stage. lol I think you could be right James, it’s a Harry Turtledove novel. But it looks like he decided to use a different pen name (or possibly his real name). Looks damn chilly to me. She’s got bare feet, surely that’s a recipe for some nasty frostbite. Oh, James, I wish it was Balamling. That actually sounds slightly exotic to an English ear. But read more carefully, through the pounding headache, and it turns out to be ‘Balamung’ (or rather ‘BALAMUNG’), which sounds… less exotic. To me it sounds like some sort of fictional fish. An *ugly* fish. Probably a bottom-feeder. I had to double-check to make sure I was reading the author’s name right. Oh, I thought it was “Allen Iverson” that wrote this. “Trokmoi hordes” — Sounds like those swarthy ethnic orks are closing in on our white-bread heroes. Or something. This is going to sound weird, but I had a completely different book with the same cover image when I was a teenager (late 70s). Back then, it was a Michael Moorcock book, and it really did feature sled-boats. Actually Harry Turtledove *is* his real name, CSA. But his editor thought no one would think “Turtledove” was a real name so he might as well have a macho Norse pen name if everyone was going to think it was fake anyhow. Somehow, that just made it worse. Is trok something filthy in French, by any chance? Shouldn’t this be ‘WAS BLOOD’? Only Grignr the Barbarian could vanquish the evil sorcerer Wangsack’s barbarous barber hordes! They WERE BLOOD, but now they’re not? How does that happen?